The NJCPA Scholarship Fund provides $6,000 one-year scholarships to accounting students at New Jersey colleges who are currently in their junior year or in their senior year and entering an accounting-related graduate program ​in New Jersey. Scholarships are awarded based on academic performance, an essay and personal interview. Contact Pam Isenburg at pisenburg@ njcpa.org or 973-226-4494 x241. One-Year Scholarship Applications for the 2020 scholarship will be available in the fall of 2019. Submission Deadline: Tuesday, January 8, 2019. If you currently have an NJCPA account please login before continuing with your application. Prepare a 500-word essay on the topic below. Copy and paste your essay into the application for submission. Please refrain from including any identifying information in your essay such as your name or school. Your essay will be judged on the following areas: content and originality; commitment to being a CPA; and, grammar, language and organization. An essay that exceeds expectations will demonstrate that the question is answered clearly and accurately and covers all topics requested. The essay is unique, creative and engaging. Language and vocabulary demonstrate sophisticated and exceptional use. An exceptional understanding of the CPA profession is indicated. The candidate is excited about what he/she can accomplish as a CPA. How do you see the accounting profession changing? How do you think your role as a CPA will relate to these changes? Be a resident of New Jersey attending a NJ college or university with a minimum 3.2 overall GPA through the end of the Fall 2018 semester. Be an accounting major or have a concentration in accounting with at least 12 credits in accounting completed by the end of the Spring 2019 semester, with a graduation date of December 2019 or later. Have a current junior-year status or above in an undergraduate program. Be enrolled in an NJ accounting–related program in the Spring 2019 semester or entering a NJ accounting-related graduate program in the Fall 2019 semester with a graduation date of December 2019 or later. Submit all four (4) of the items below by Tuesday, January 8, 2019. Your application will not be considered without these. Official transcript (including fall semester). Have your school send your transcript directly to NJCPA. You may also ask the accounting department to send unofficial transcripts directly to NJCPA. If 12 accounting credits have not been completed by the end of the Fall 2018 semester, you must provide proof of registration for the Spring 2019 semester showing additional credits. All Scholarship recipients must provide an official transcript showing 12 completed accounting credits and a minimum overall GPA of 3.2 by the end of the Spring 2019 semester. 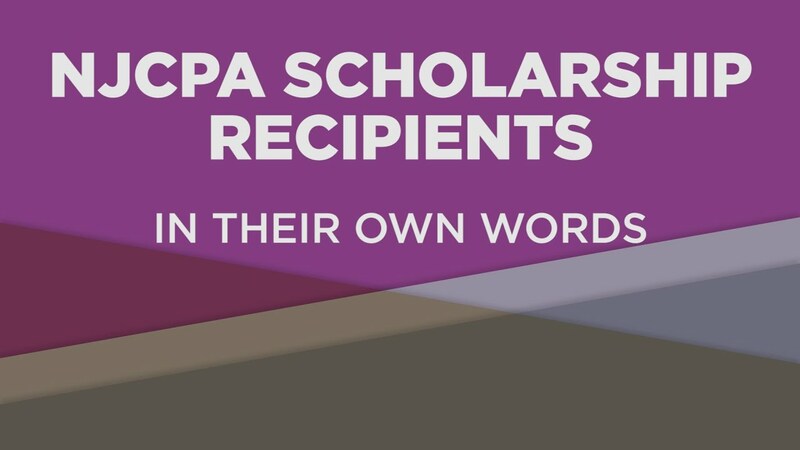 Email your transcripts and resume to scholarship@njcpa.org or mail to NJCPA, 425 Eagle Rock Avenue, Suite 100, Roseland, NJ 07068. All scholarship finalists must be interviewed on Saturday, January 26, 2019 at the office of Ernst & Young in Iselin, New Jersey. The snow date is Sunday, January 27, 2019. Scholarship payments are only made to New Jersey colleges/universities.